If you’ve ever thought of starting a neighborhood watch group, the WBNA and MUD would like to help you get it up and running. We set a time, come out and go door to door with you gathering information for the Emergency Contact List and telling folks what you’re doing. 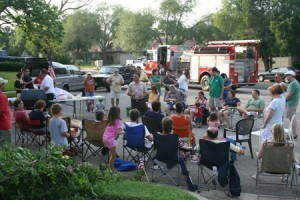 Next, we set a date with the Travis County Sheriff’s Office for a block party. One of the Travis County officers comes out to your street with all the handouts and info on securing your homes and speaks for about an hour or so. Tom Cheshire, MUD Safety Chair, cooks hotdogs & sausage wraps and brings sodas & chips that the MUD provides to In-District groups. We make a party of it and everybody gets to know each other, which always makes for a safer community. Everyone gets educational booklets, a Neighborhood Watch decal for your front window, and a laminated Emergency Contact Sheet with all of your neighbor’s information on it. This allows for mass e-mails in the event of an emergency or even a missing pet and it also allows neighbors to contact each other at work or by cell should that be necessary. If you think this might interest you, our contact information is listed below. Feel free to call if you have any questions. With the holidays almost here, we’d like to get as many Neighborhood Watch groups set up as possible. Help us start one on your block. For more information about setting up a Neighborhood Watch in your area, contact Debby Thompson at (512) 656-0654 or deborah_thompson@earthlink.net. Deputy Banks with Travis County Community Outreach is available for detailed security inspections of your home. She may be reached at (512) 854-3248 or zainab.banks@co.travis.tx.us . Watch for upcoming safety seminars by the Travis County Sheriff’s Office hosted by the Wells Branch Neighborhood Association. Check our website for updates. How to make the most of YOUR Neighborhood Watch Program!